Spearfishing is an activity that can demand a lot of equipment, and it isn’t always easy to decide what is the best spearfishing gear to choose. Be precise when you want to catch a fish. It goes without saying that there is a difference between the elite that competes in the world championships of spearfishing and a beginner. This also means that they don’t need the same equipment – although the most expensive diving gear is rarely the best. But then what equipment should you choose for spearfishing? For some beginners (and a few with experience) in spearfishing, “value for the money” will be the biggest determining factor. That way you, as a beginner, can figure out if this sport is something for you before you invest a fortune in equipment that is marginally better. Will last quite a while. Some sort of “beginner” weapon. Should you need more in depth information about each information and what to look for regarding each of the above products I have written a lot of gides. Below you will find a short recap of each area. The mask is the most important part of your equipment. You can do with out a lot of the equipment, but without the mask, it is simply impossible to see anything which makes it impossible to catch a fish. The wrong mask or a mask that doesn’t keep out the water can ruin your whole experience. Masks for spearfishing are available in many different sizes, shapes, and price levels. But which mask should you choose? First and foremost, you should select the mask that fits your face the best. Can be attached just by pushing it lightly toward a wet face without needing to use a head strap. Has a silicone skirt – nothing else works! The skirt on the mask shouldn’t be clear silicone. 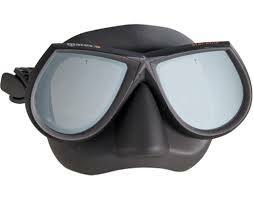 You can read more about what to look for before selecting a mask for spearfishing here. It is worth selecting a good mask. It pays off in the long run! As a beginner, you can use the fins you happen to have. But it is clearly worthwhile to invest in some free-diving fins once you start getting into spearfishing. 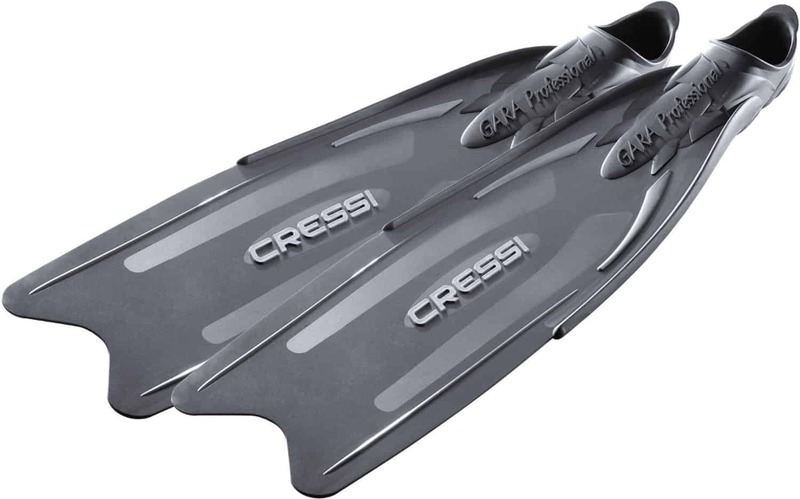 The best fins for spearfishing are long fins that cover the entire foot. fins that are long and soft. Fin without a heel strap. The angle between footpockets and fin blade. A pair of fins that are a few numbers greater than your shoe size. The material that meets your demands. We have written a detailed blog post about what to look for when you buy your fins for spearfishing here. It’s up to you what kind of snorkel you choose, but I would recommend the simplest snorkel you can find. Soft snorkels (made from silicone) have a tendency to bend and close off the air when you swim fast. For this reason, they are not recommended. Snorkels with a special contraption at the top that is supposed to keep out the water or prevent it from splashing down make it harder to breathe and empty the snorkel of water. Read more about what to be aware of before buying a snorkel here. Many beginners start with a Hawaii slings. I personally started with a hand spear, and since you are forced to get close to the fish to catch it, a spar can help you learn valuable information on the reactions and habits of fish. Depending on where you do your spearfishing, it may be a cold experience since you will be in the water for extended periods. There are suits made especially for spearfishing. They are very soft and warm. With a wetsuit made for spearfishing, you can stay warm two to three times longer than in a regular scuba wetsuit. Read the things you need to look for when buying a wetsuit for spearfishing here. There are many different harpoons for different types of fishing. You can divide them up into elastic harpoons and pneumatic harpoons. Elastic harpoons are propelled by one or two elastic bands. These harpoons are the most common and the cheapest. A pneumatic air harpoon is propelled by a pneumatic spring that you compress with the spear. You can adjust how powerful it should be according to how much air you pump into it. 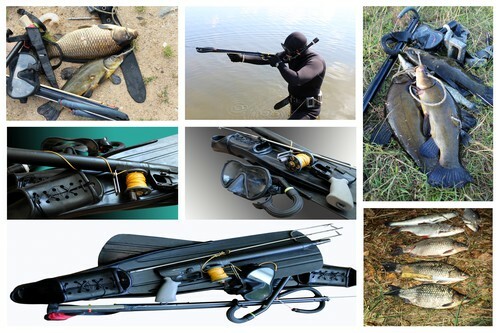 Read our blogpost about spearfishing guns here. 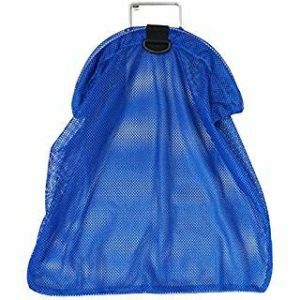 In the US and many other places all divers and snorkelers are required to display a divers-down flag. The minimum size for any divers-down flag displayed on a buoy or float is 12” by 12”. The flag needs to be blue and white (“diver in the water”). The buoy must be orange, red, or yellow. The diver drags the buoy behind him while slinging by attaching it to a line or plastic tubing. As a buoy line, you could, for instance, use a clothesline with plastic coating, or you could use plastic tubing. Both have the advantage of being buoyant, so they don’t get stuck between rocks and such. Plastic tubing can be purchased at an aquarium store or specialty store. The most commonly used buoy is a torpedo buoy. 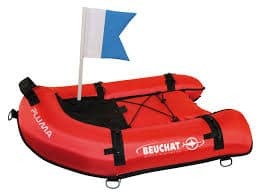 This is a cigar-shaped buoy that creates minimal resistance in the water. Be sure to always check the rules in the area where you want to dive, but even if its not required to use a buoy or float were you dive I still recommend it as it makes diving more secure. Sooner or later, your buoy will spring a leak, at which time you can discard it or fill it with spray foam. When the buoy is filled with foam, it will take up more space in your car, though. The buoy line always needs to be tied to the lead belt, so you can free yourself from it by losing the belt. For spearfishing, you use a knife to kill the fish, but most importantly, the knife is part of your safety equipment along with your vest and your buoy. You never know what you might run into as far as fishing nets and the like, so it’s good to have a knife, so you can cut yourself loose. Fishing nets are made from fishing line and are almost impossible to see. Therefore, it is a good idea to bring a knife at all times. 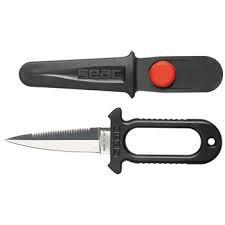 Read my recommendations of fishing knifes here. When you are snorkling as a spearfisher, it is an advantage if you are not completely counterbalanced at the surface. First of all, this is not where you dive, and secondly, it’s pretty nice to be able to float to the surface, if something should happen. It is usally an advantage, if you are counterbalanced at about four to five meters. But this will of cause depend on the depth at which you want to dive. If you are going to dive in shallow water, you should always wear more lead. But you need to be aware that it is pretty annoying to go floating off to the surface all the time, when you would like to lie and wait for the fish. As a rule of thump you should use about 13-15 pounds for a seven-mm wetsuit. 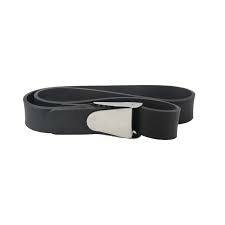 Always be ready to ditch your lead belt if something happens! Lead belts are so cheap that they aren’t worth risking your life over. A back lead is a special type of lead belt fashioned with a large lead weight on the back and two smaller ones at the sides. The lead is positioned like a backpack. Back lead has the advantage of distributing weight better. If a lead belt makes your back hurt, back lead may be the solution. Read our blog post about lead for spearfishing here. A stringer is used to hold the fish while swimming, since swimming around with dead fish in your hands isn’t very practical. You can make it yourself from copper pipes, which you cut and drill a hole in the middle of. Having a pair of neoprene socks in your fins feels nice. It will help to keep your feet warm and prevent wear marks. Neoprene socks are easily destroyed by walking on land, so it’s a good idea to have an old pair of shoes or sandals to wear on your way out to where you’ll be diving. 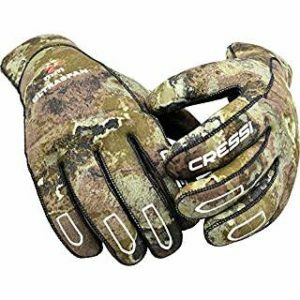 Depending on the temperature on the water, you need to choose five- or three-finger gloves. Five-finger gloves will often be used in a temperature around 15 to 25 degrees Celsius (59-77 F). If the temperatures are colder, it’s nice to have a pair of three-fingered gloves. Unfortunately, the three-fingered ones are pretty clumsy, making it harder to handle things like a spearfishing gun. An inflatable life vest is a good safety measure for spearfishing. The idea is that the vest makes it easier to bring a diver back to the surface and turn him face up in case something happens. Unfortunately, most diving accidents happen because of swallow water blackout, and you don’t feel that coming. 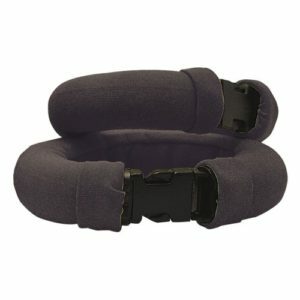 Even so, the vest is a good thing, since it can inflate if you get tired/hurt and want to lie at the surface and relax. Remember to remove the chalk tablet from the vest after purchase; otherwise it will inflate when you get underwater ;). If you are going cave hunting, a good light is alpha and omega. Because you need to have your weapon with you, a light for spearfishing can’t be too large, and it needs to have one-handed operation. 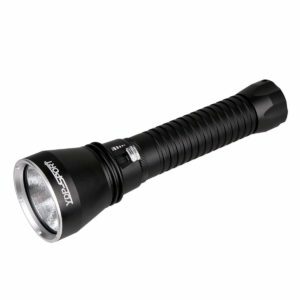 The most common type is a flashlight model. If you will be diving in water below 5-10 degrees Celsius (41-50F), it can be very cold for your cheeks and lips, since they are not covered by the mask or by the hood on your wetsuit. If the water gets very cold, your cheeks will swell up and become numb. Your lips will also get cold and that can make your teeth hurt. In regards to your teeth, you can fix it somewhat by cutting yourself a mouth wrap from old neoprene. It is also possible to buy a special hoods, where you cut your own holes for the mask and snorkel. An added advantage is that these also prevent jelly fish burns J. In order to get a better weight distribution, many spearfishers are using lead on their ankles or fins. Ankle lead is lead chains for the ankles. Fin lead is special lead that can be screwed onto the fin blade. In many cases, this will be unnecessary, but this kid of lead can be practical, when you are lying at the bottom waiting for the fish since they keep your legs from floating upward.